I’m always looking for new side dishes to go with traditional main courses. Veggies don’t have to be bland and boring….you know…how many times do you take a “no thank-you, I’d rather not eat this but will take a compulsory scoop of boiled peas!”. Laurel and I have talked a lot about the Vitala Longtable Dinner…how can you tell we loved it! The chef Dino Renaerts of the Bon Vivant Group prepared a squash dish from squash that had been grown on the property and we could not get enough of it! We had to know what was in it so that we could try to recreate it for our Thanksgiving cooking class at Lepp Farm Market. 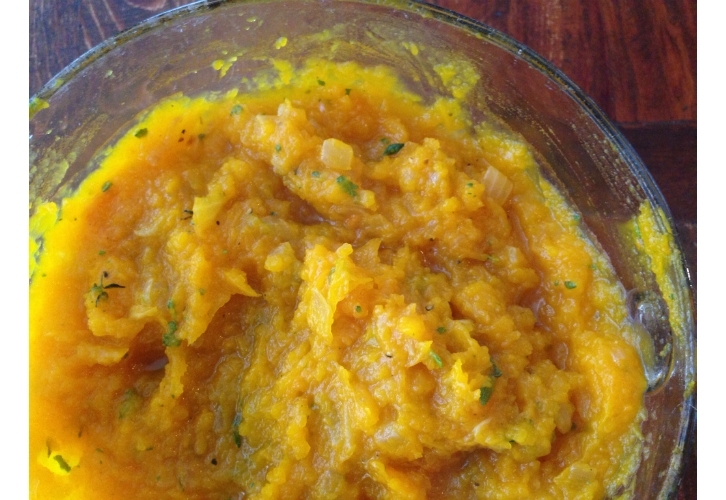 We just taught the class on Monday and I’ve heard some pretty good reviews on the squash…some said they will be making it for their Thanksgiving dinner…I love that! So, here’s our best attempt at the dish we had. 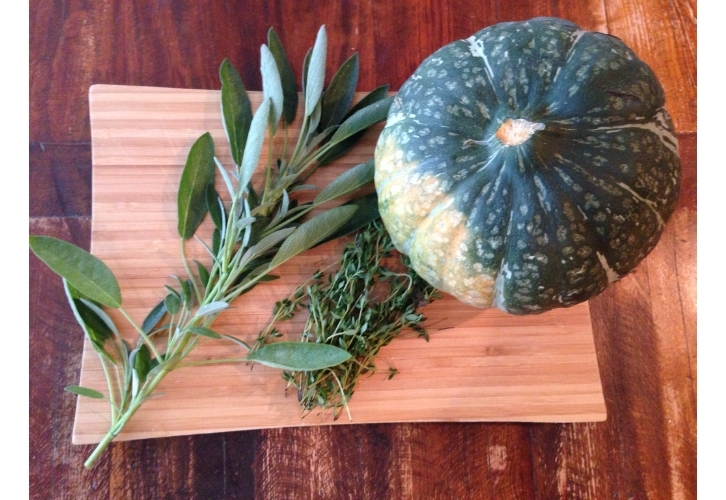 The kabocha squash is sweet and nutty and pairs so well with sage and thyme. Wash the squash, cut in half and clean out seeds. You can roast the seeds just like pumpkin seeds. Put in pan with water and roast. The skin will get slightly browned and soft. Let onions sweat in olive oil. Don’t brown or caramelize too much. Onions should be soft and transluscent. Here’s what the roasted flesh looks like. It’s quite dry and almost falls out of the skin. Scoop it out into a mixing bowl. 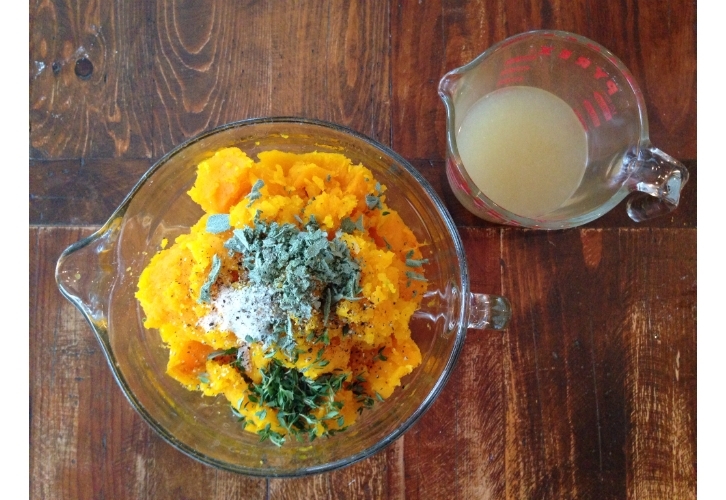 Mix the roasted squash with dried, crumbled sage leaves, fresh thyme, sea salt, pepper and chicken stock. No mashing required…just stir up with a spoon! Add the onions and you are good to go! Preheat oven to 450 degrees. 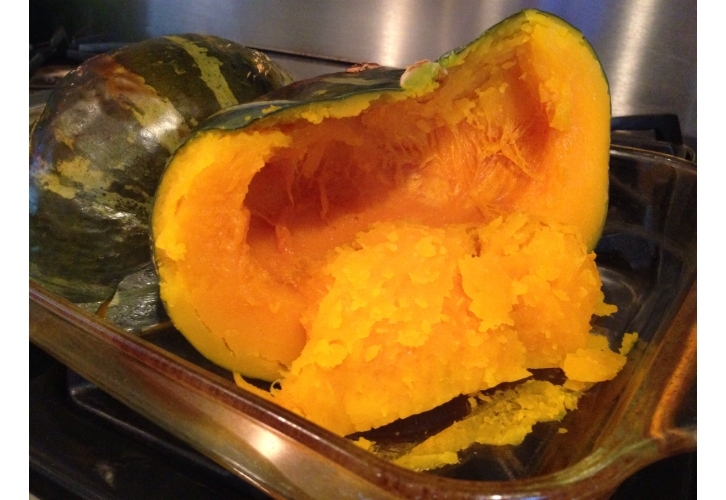 Cut squash in half and remove pulp and seeds. Put cut side down in a 9” x 13” pan and add 1 cup of water. Roast for 40 minutes and add water if necessary. In a skillet, heat up olive oil on medium low heat. Add onions and let sweat about 10-15 min. Add a pinch of salt and pepper. Put sage leaves on a plate and microwave for about 2 to 2 ½ minutes. 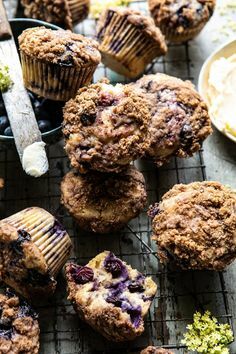 Once cooled, crumble. Scrape out squash flesh from the peel. You should have about 6 cups. Add onions, sage, thyme, salt, pepper and heated chicken stock. Mix together. Serve up! This is a perfect addition to your turkey and your family will love it. My niece who usually doesn’t touch squash finished all of it on her plate….I’ll take that as an approval! And an added bonus is that you can make this dish a day ahead and heat it up in the microwave before serving!